It's snowing in space! Well, not really — but astronomers are calling this colorful nebula a "winter wonderland." With that frosty blue hue and flurries of stars speckled across cosmic clouds, this wintry nebula is simply stunning. X-ray data from Chandra and ROSAT are shown in purple. The brown-orange color represents infrared data from Spitzer. Its frosty blue highlights represent optical, or visible light observations, from SSS. The resulting composite is an image so vibrant and fun that it would make for a stellar design on a painted tree ornament. 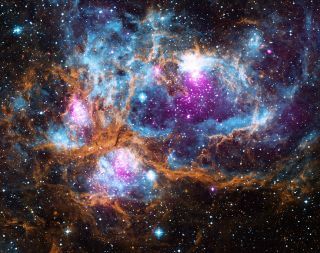 "NGC 6357 is actually a 'cluster of clusters,' containing at least three clusters of young stars, including many hot, massive, luminous stars," NASA officials said in a statement. "The X-rays from Chandra and ROSAT reveal hundreds of point sources, which are the young stars in NGC 6357, as well as diffuse X-ray emission from hot gas. There are bubbles, or cavities, that have been created by radiation and material blowing away from the surfaces of massive stars, plus supernova explosions." Young, hot stars in NGC 6357 emit powerful radiation that strips hydrogen atoms in the surrounding gas of its electrons. Astronomers call this type of ionized hydrogen cloud an HII region. Those young stars also emit bright X-rays, which is why researchers use Chandra and other X-ray telescopes to look at them.